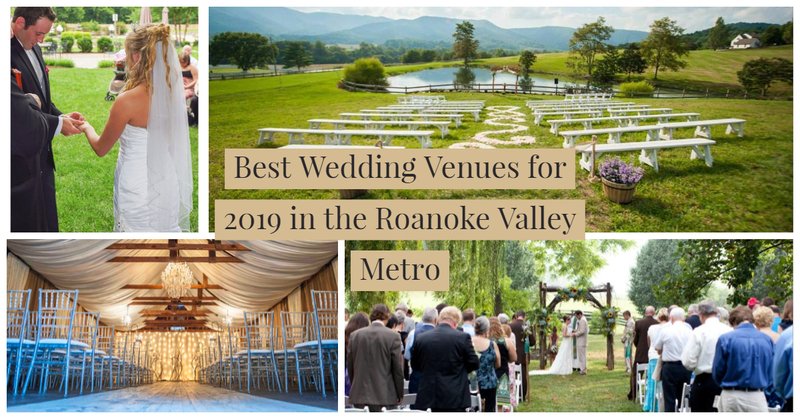 The wedding venue is a great place to get married and the Roanoke Valley has some of the most beautiful places to get married. With new ones popping up each year, we wanted to give you our top picks for being above and beyond, reasonably priced and ones that couples in the past tended to love the most. Here is our favorite picks for 2019 and some real reviews from past couples that got married there too! Wisteria Ridge is by far the best selection for a wedding venue in the area. The views are awesome and the best Southwest Virginia has to offer. Mary and her staff were outstanding and so helpful. The venue has it's own wedding planner, Whitney was knowledgeable and made things go smoothly. One big deciding factor in us choosing this venue was that they has actual bathrooms. Thanks for making for a very special day for my daughter and son in law. The scenery at Wisteria is beautiful year round, everything for my daughter’s summer wedding was gorgeous! The space was large enough that none of us felt crowded and there was room to move between the tables under the tent and the outdoor seating areas to socialize. My daughter appreciated the large bridal suite for her and her girls to get ready in. Looking for a venue that offers exceptional service, amazing views and multiple event settings? Look no more.... We are so happy we chose to have our wedding at Wisteria Ridge Event & Conference Center. Located in the beautiful foothills of Callaway, Virginia, the views from the lawn is absolutely stunning! Mrs. Mary Wray and her team were amazing! She just made it so easy from the moment we booked right through to our wedding. Nothing was ever too hard, Wisteria Ridge really went above and beyond to ensure it was the best day to our new beginnings as Mr. & Mrs.
We got married at Sundara this past June. Sundara was only the second venue we toured but from the moment we stepped on property, we knew that it was where we wanted to get married. It is just an absolutely stunning location, and everyone involved with the property is so kind and accommodating. They have everything down to a science and anticipate every single need. Cari is a superstar, truly. She answered all of our questions, and handled every single aspect flawlessly. The day-of, I didn’t feel stressed at all, because I knew Cari had everything taken care of! That piece of mind is priceless. I truly couldn’t have asked for a more perfect location or a lovelier experience. It was 100% the best wedding choice we made, and we would recommend it to anyone and everyone! Our guests still talk about how wonderful it was 3 months later! Looking back, I can't imagine my wedding day at anywhere other than Sundara! The venue was not only a gorgeous setting for my outdoor ceremony (though it was hard to choose from multiple options on the property! ), but also for the tented reception where just a few heaters provided plenty of warmth. There was ample room in the house for myself, my bridesmaids, and my mother to have hair styling and makeup application and a separate area for my now husband and his groomsmen to have a few drinks and shoot pool before the ceremony. Cari Reichl, the venue manager, could not have been more amazing from first booking through to the day after, when she had already boxed up leftover food for me to pick up and take home! I cannot recommend Sundara highly enough, especially if you're looking for an outdoor venue with years of experience, but whose staff will still make you feel like you're the only wedding on their calendar! Samantha with the Woodland Place was absolutely wonderful to work with. I had changed the date of my wedding to December 2018 from the original date of September 2019. She was very understanding of the situation that caused us to up our date and responded very quickly to any questions I had regarding the venue. She also had a ton of options to choose from in regards to centerpieces and linens, which was a huge plus that those were provided for us to use! The Woodland Place was beyond what I could have ever wanted. Dana was awesome to work with and made sure that we had absolutely everything we wanted and needed. Our ceremony had been planned to be outside but it had rained for several days leading up to our wedding. We made the decision to move it indoors and it was still absolutely beautiful. You definitely get your money's worth at this venue. They include so much and it takes a lot of stress off of you while you plan your big day! This was a great bang for my buck and Dana was so easy to deal with. I felt set and ready to go. I didn't have to harass to get things my way. You are allowed to use all their fru-fru so you can actually save money on centerpiece production, they have a great variety of styles and colors to boot. And they have a direct flower shop connection, that makes is a one stop shop. It was a great experience. Loved It!!! I cannot praise The Kyle House enough. Jim and Amanda Schaal have worked tirelessly to change their venue into a dream location. I started planning my wedding early February 2015 and The Kyle House was my first choice. The House has the a sweet rustic charm,the barn in which is considered the chapel is a slice of heaven. When you walk in, it will truly take your breath away. If you plan to have a wedding that is at least 100 people, this venue is for you. The food is absolutely amazing, the price of alcohol is very reasonable, and their house Manager, Kelly will help make your wedding move smoothly and a wealth of information. It was an easy choice to go with The Kyle House. If you have a small budget or a larger one, you will get what you pay for. I could not have had a better day. We were married October 11th, 2015 and the whole day was beautiful. I wish it would have lasted longer! I have recommended so many brides to visit this venue and experience its beauty. We had our wedding here last night and it was truly a dream made into a reality. Amanda and Jim were easy to work with and always answered all of our questions honestly and in a timely matter and were so much help to us, because of them our wedding day was as stress free as possible. I highly recommend this venue because the food is to die for and you’re getting your money’s worth to have the perfect wedding. It truly could not have been a better day. Thanks to all of the staff at the Kyle House as well for being so kind and helpful. We strongly recommend choosing this venue for your wedding. Oh, you need to get married here and nowhere else. The customer service from Amanda and Michelle is out of this world. They are very accommodating and hang on your every word. You need to hire Michelle as your wedding planner because she keeps everyone on task and will also be your right hand lady for anything and everything you need. The venue is perfect for 30-120 people and very intimate. Everyone that came to our wedding was so impressed with the Kyle House and raved about it all night. The food is great too, just make sure to do a tasting because some items can be a bit too spicy for some guests. Everything here is seamless and easy. You will love it here as well! The Kyle House made our wedding day so amazing. Not only was the day amazing, but the planning process was so seamless on their end. Jim and Amanda were so helpful, kind and responsive. This venue was so incredible and unique. We got so many compliments on it from our guests. It is reasonably priced as well, they don't nickel and dime you like so many other venues do. If you are looking for a laid back unique wedding this venue is amazing.